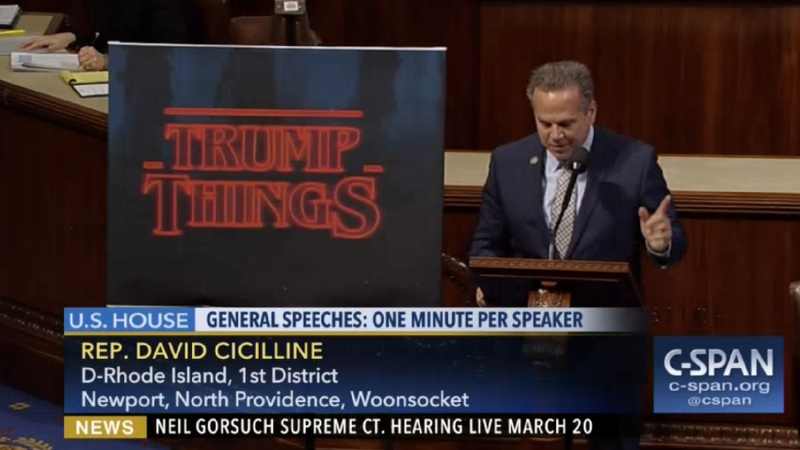 Congressman David Cicilline (D-RI) took to the House floor Thursday to talk about the current crisis in President Donald Trump’s administration. He berated former National Security Advisor Michael Flynn’s reported ties to Russia, Trump’s Muslim travel ban, and the refusal to address Flint’s ongoing water crisis. In order to make his point clear, he gave a comparison everyone can relate to: Stranger Things. This man just became my new hero. Forget statistics, graphs, or snowballs. If you really want to make a dent, you’ve got to hit politicians where it hurts, with their binge-fests.